For over 100 years International Women’s Day has celebrated the achievements of women worldwide and the struggle for gender equality. This year, the theme is #Balanceforbetter to continue the fight for a gender-balanced world. This worldwide celebration of women is a very important matter for us at Your London Florist. Typically, within floristry, there is the stereotype of ‘roses are red, violets are blue’ and being a florist is the easiest job in the world…wrong. We wanted to explore the ‘behind the scenes’ of floristry, to prove that women can do all the heavy lifting, messy duty jobs and that it isn’t all about pretty bouquets and beautifully presented arrangements. For generations a woman’s ‘place’ was at home and not at work, however through years of protests and the determination from women, it has been established that a woman can have both ‘brains and beauty’. Behind the scenes at Your London Florist is a team of talented, strong, and empowering women who embrace the day to day challenges of floristry. From loading a van full of heavy arrangements, climbing ladders and carrying extremely heavy buckets, our florists know how to get the job done. To collectively celebrate the empowerment and equality of women for International Women’s Day, we’ve put together a montage of the amazing and talented women who make up our team here at Your London Florist. Each and every one of these ladies are a credit to our business and deserve to be celebrated, not only on International Women’s Day, but all year round. What is the most challenging thing about floristry? The hardest thing is by far the unsociable hours you have to work. However, being with my amazing team of crazy colleagues is the best way to spend that time! What do you love the most about floristry? There are a couple of things really. On a professional level having my own business means I get to try new things out in our studio. I want to give my florists the best environment to add their own creativity to their work. This is a dream come true. On a personal level, you can’t beat the level of joy that comes from your clients when they complement your work and give great feedback. It makes me so proud! The most challenging thing I would say is personally dragging myself out of bed at 4am to deliver corporate flowers throughout London. However, it’s worth it in the end. What I love most is stepping back and seeing a finished design whether it’s a wedding, hotel vase, some floral flamingos or simply a pretty bouquet. Saying I made that…that’s what I love. Making sure you understand everyones strengths and weaknesses to ensure people have the perfect jobs to do most suited to them and that they still enjoy the process. I absolutely love “requests” out of our comfort zone, where we need to do some planning and research beforehand. I also really enjoy working in a big team and meeting all the creative people. You need to be a little bit crazy to be a florist but I wouldn’t change a thing! Being so passionate that you eat, sleep and breathe flowers. It is ever changing. It is so fulfilling when you can bring a vision that someone has to life. The most challenging thing is the very long and unsociable hours that comes with the job! I love dealing with weddings and coming up with different ideas to fit every brides dream! I love seeing the end results after sometimes over a year of planning and organising! Seasonal changes! I love watching everything Christmassy come in and then a couple months later it’s peony season! 5 years ago, this cool looking guy came into my shop and asked for my help to choose a plant for his girlfriend. Judging by his character, and what he told me about the special lady in his life, we decided to go for a pretty unusually looking plant – the Calceolaria. A few weeks later his girlfriend walks in, with the plant in her hand, and a very guilty look on her face. The plant was dead. This was how I first met the talented Emma Block. 4 years (and a lot of tea and fun) later, I was delighted when Emma and the Alex got engaged, and asked me to do their wedding flowers. I couldn’t wait! This loved up couple decided upon Clissold House for their ceremony. A gorgeous venue in the middle of Clissold park in Stoke Newington. All we decided Emma had to do is to give me an idea of her colour scheme, a list of flowers she likes, and then she gave me complete freedom to create the arrangements. For Emma’s bridal bouquet we chose soft colours peonies, scented David Austin roses, ranunculus, anemones, astilbe and delicate sweet peas, which I arranged in a loose posy. The bridesmaids bouquets we kept more compact and neat. I was most excited about Emma’s flower crown, as we made it using Emma’s mum’s original wedding veil! For the ceremony we created a cherry blossom arch which made such an outstanding and unique feature. All the way along the aisle we attached small flower posies to the chairs and made country style arrangements in deco jute bags. After the ceremony the room was transformed into a dining area where we placed table centrepieces in French style urns. I was so lucky to be part of their wedding day, especially after meeting them so fortuitously so many years earlier, and hence so so touched to be mentioned in their speeches. We hope you all spoiled your mums rotten today! And we hope all you mums got spoiled rotten! If you’ve been following our blog this week you would have seen our florists daily tribute to their own mothers, by creating personable bouquets in their honour. Today, in the final episode in the series, Migle got to give her mum a tribute bouquet. The Elena bouquet is an explosion of red roses, adorned with scented lilac, forget me nots and purple anemones to emulate her huge character. 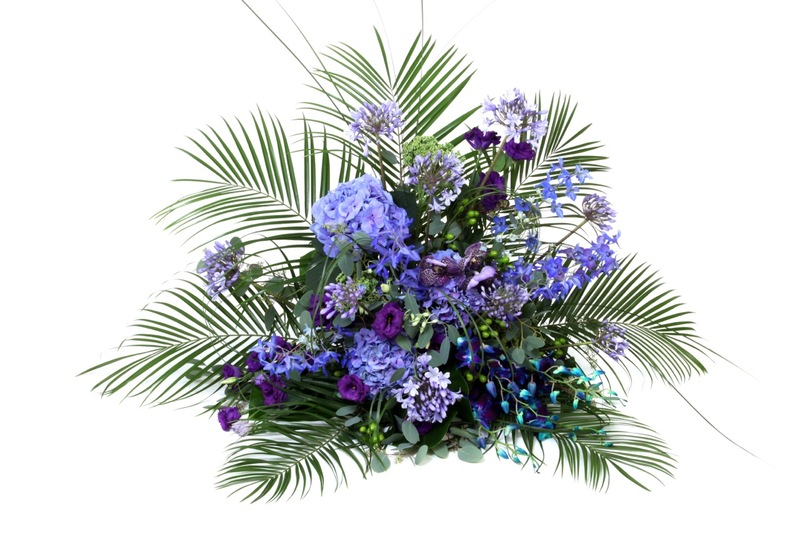 Blue muscari and eucalyptus foliage bring it to life! On Mother’s Day eve, Karen’s flower arrangement was the “Margaret Rose bouquet”. She chose a selection of lovely big headed roses in pink, lilac and cream colours with a touch of purple clematis and veronica. 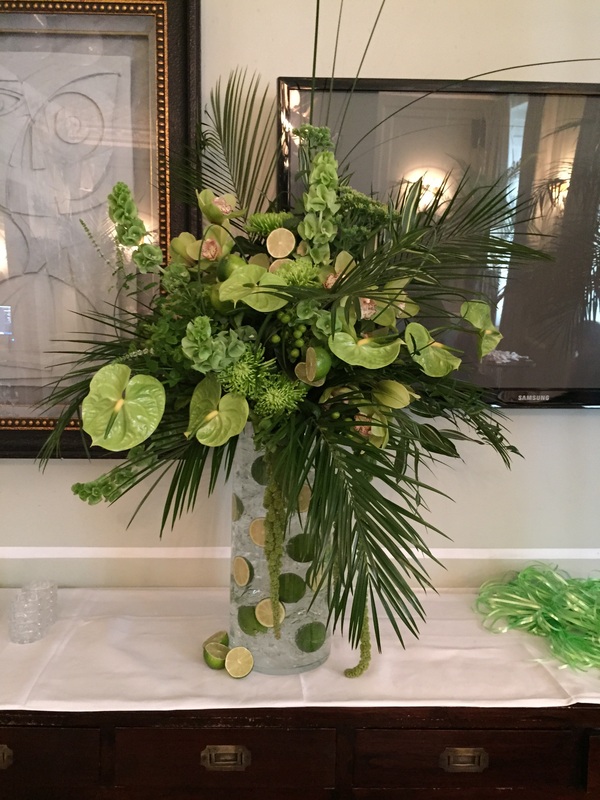 For foliage Karen used eucalyptus, viburnum, and delicate lily grass. If your mum is a fan of roses you can order the same bouquet on our website! – click HERE and we’ll deliver this gorgeous bouquet on Mother’s day. Maria’s bouquet was created specially for her mum Christalla. “She loved wild flowers. Nothing fancy – as natural looking as possible”. To arrange a perfect mix, Maria chose pastel amnesia roses, tulips, anemones, white lilac, cymbidium orchids and scented tuberose. If you think your Mum will like Christalla’s bouquet click HERE and you can choose from three different sizes. On Wednesday we kicked off our feature with Arune’s Tribute to her mother Vida. Thinking back to where she was born and raised in the countryside, Arune wanted to make it a really rural experience, using a healthy amount of grass and foliage. Add to the mix pastel colours with fragrance, as “it’s not just important that flowers look good, but they need to smell good too!” Arune orchestrated delicate paper whites and the strong but sweetly scented tuberose amongst the foliage. Intersperse some white tulips, and top it all off with her mum’s favourite flower – big headed sweet avalanche roses – Queen Rose! Click HERE and you can order gorgeous Vida bouquet from our website. Don’t forget the discount! Thank you “Photography By Adam” for making us look so pretty! When I ask other florists what flowers they would pick as their dream Valentine’s Day bouquet they have the enviable ability to pick any of the most beautiful flowers in the world. My dream bouquet? Fragrant and delicate Lilly of The Valley; soft and elegant Lilac; blush Garden Roses and a touch of blue forget me nots. Even with all that choice, the magical rose, that most common of traditions on Valentines Day features in almost all the answers I get. The rose exudes so much passion, scent and beauty. But they don’t need to be the only bloom to strike an arrow into the heart of your Valentine this year. On a rainy day like this we thought we’d invite you to come with us on a journey, to a little tropical island, surrounded by clear blue sea. … yes, at Your London Florist we’re still in holiday mode. Summer might be coming to an end, but we just want to keep on dreaming, and today we want you to dream along with us as we visit flower paradise! Green anthuriums, palm leaves, exotic cymbidium orchids and moluccella, mixed with some mint and of course – a dash of lime juice to finish. In this all-blue sea cocktail we used hydrangeas, delphiniums, agapanthus and very unusual dendrobium orchids. 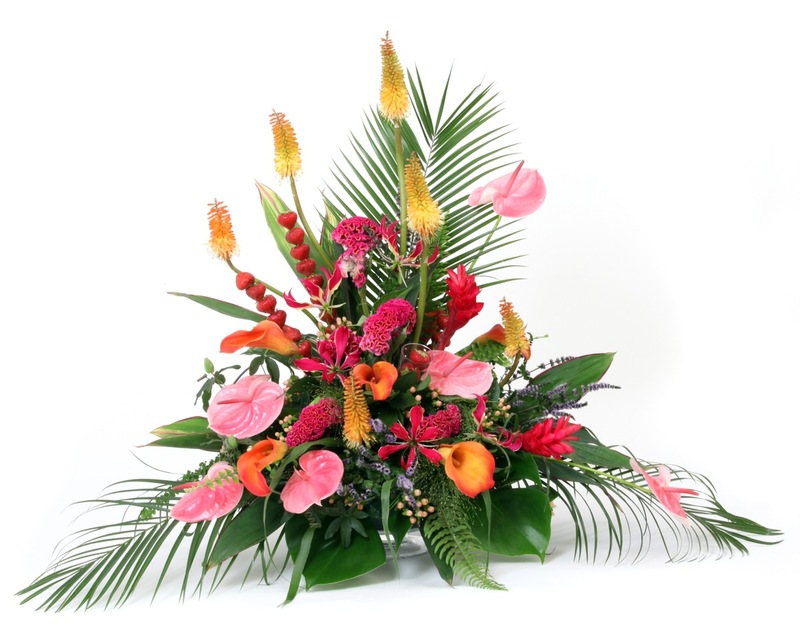 Ah, funky pina colada – dreamy pineapple eremurus, celosia, bird of paradise (because pina coladas somehow always remind us of those days in paradise) with a cherry on top. His and hers, the creation. Fiery gentle gloriosa and hypericum complemented with strong bamboo. But of course, it’s all about strawberry base line. 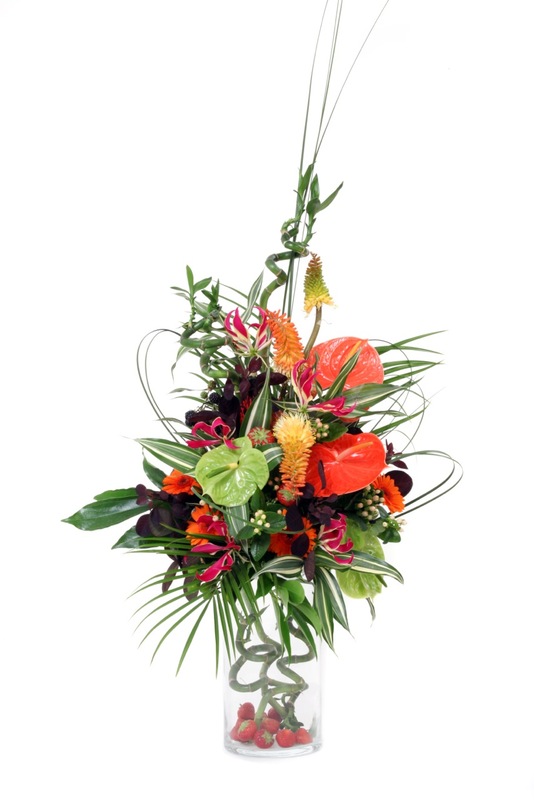 Calla lilies, pink flamingo anthuriums, kniphopia, gloriosa lilies and cheeky strawberry skewers to seduce your lips. Let us know which one is your favourite by leaving a reply below! And when you realise that the grey London sky doesn’t inspire the day-dreamer in you, you can order on line for your dinner table centre piece, as a unique gift, or simply to entertain at your bikini party! 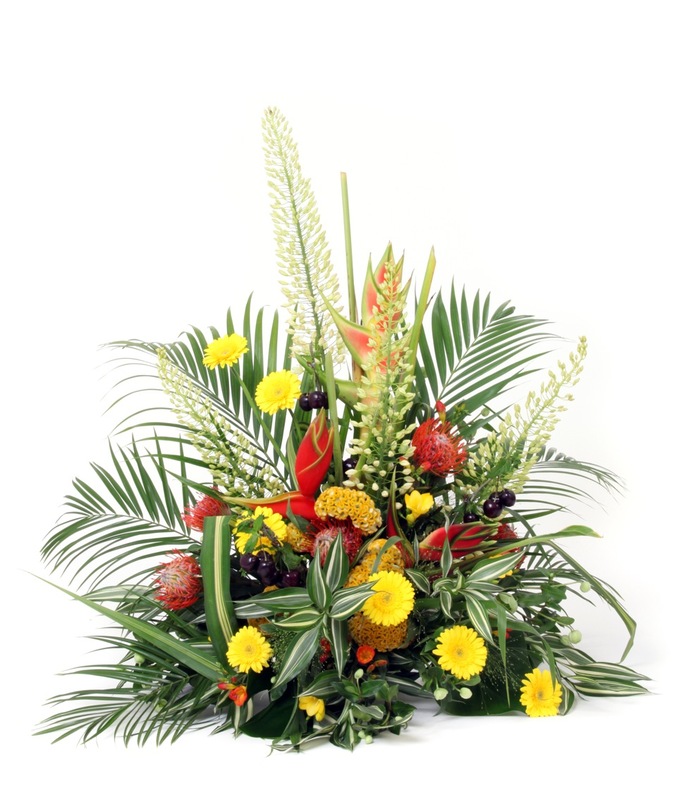 Just choose your favourite flower cocktail and start dreaming, because this tropical arrangement could be standing right by you in your own little paradise. Let the holiday begin (and never end)!